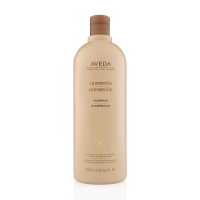 Brighten your highlights and illuminate blonde and lighter shades of hair with the Aveda Pure Plant Camomile Shampoo. It gently cleanses, as well as effectively soothes and nourishes your hair and scalp. Aveda Pure Plant Camomile Shampoo contains organically grown chamomile, which is long valued as a calming remedy to naturally cleanse your hair. It also has organically grown calendula, known for its soothing and nourishing properties. Massage Camomile Shampoo onto your wet hair. Follow with Camomile Color Conditioner.